So I’m replacing the water pump on my 08 GXP. I’m following the DDMWorks recommendation for replacement (although the turbo is burning oil so it needs replaced too). I used the half moon tool to hold the sprocket in place. When I was trying to locate the holes to reinstall the pump on the gear, I dropped a 2” bolt in to the engine. How much effort will it be to remove the front of the engine to access the timing chain and hopefully the bolt? I've retrieved a lot of bolts over the years with those handy magnet grabbers. There is only one difference between a handy person and one that is not. The handy person knows how to correct, cover up or hide mistakes. This type is neat too, pull trigger to energize the magnet. Hopefully one of the suggestions offered so far will help you with getting the bolt. Make sure to use a lot of Vasoline or grease to hold the bolts to the socket when doing the install. There is a little pocket down below the water pump that hopefully caught the bolt and if so, with a magnet you might be able to retrieve it. 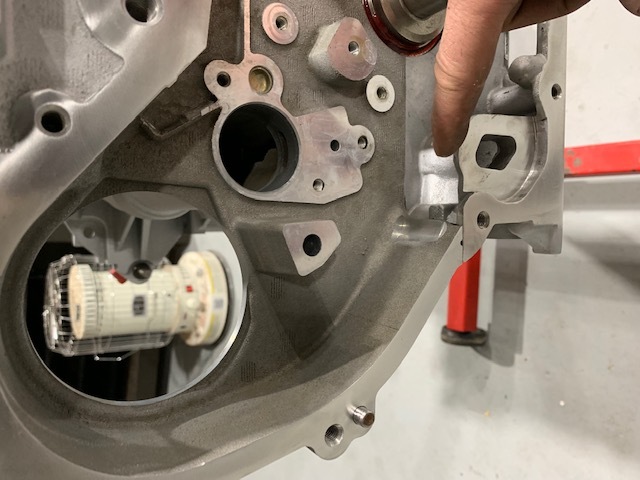 In the picture you will see what is below the water pump (big round hole) and I am pointing to the little pocket below that hopefully caught it. If you can not get it out, you will need to remove both belts from the engine, the crank pulley and the front plate. Once those are removed you will have access to basically anywhere the bolt would have went, unless it went all the way into the oil pan. easyryderca, raygun and Tronak like this. Removing the valve cover may give you better access to get the magnet tool down where it needs to go, depending on where it landed. Last edited by raygun; 03-05-2019 at 09:18 AM. I like that trigger operated magnetic pick up - without that, they try to glom onto everything on the way down. This post brings back nightmares of doing a valve job on a Jaguar straight 6 in the car and dropping one of the cam sprocket bolts into the timing case while reassembling and gearing it hit things all the way down. Fortunately it made it into the sump so a fairly easy resolution. My dad dropped a very small aluminum thing (I don't recall what it was) into one of the cylinders while changing plugs on a first generation 300ZX. Fun thing about AL: magnets don't work as well as one might hope. Not to derail this thread, but all this talk of graspers reminds me of claw graspers. It's not that magnets are new technology, but I remember growing up only having the flexible "claw" graspers and not a magnetic type. These things were a joke. I remember trying to unsuccessfully pick things up pretty often. Do you have or remember these things? I have several of those graspers and they are indispensible on boats. Drop a bolt on a car in the engine compartment and it usually falls to the ground, unless you drop it into the engine. On a boat, it drops into the bilge, under the engine or a spot that is unreachable. Most fasteners used on boats are non magnetic stainless so magnetic pickups are useless. One of my claw grabbers has a 4 foot extension to get way under things. rob the elder likes this. Last edited by syjos; 03-06-2019 at 09:19 AM. Thanks Dave for the suggestion on where it might have landed. The magnetic “worm” I ordered arrived today. Hopefully, I’ll be able to find it this evening. I really wish I would have known about the full circle tool. I would have DEFINITELY used that instead, knowing what I know now. That’s the best $13 I have ever spent on a tool. easyryderca, joybill44 and raygun like this.